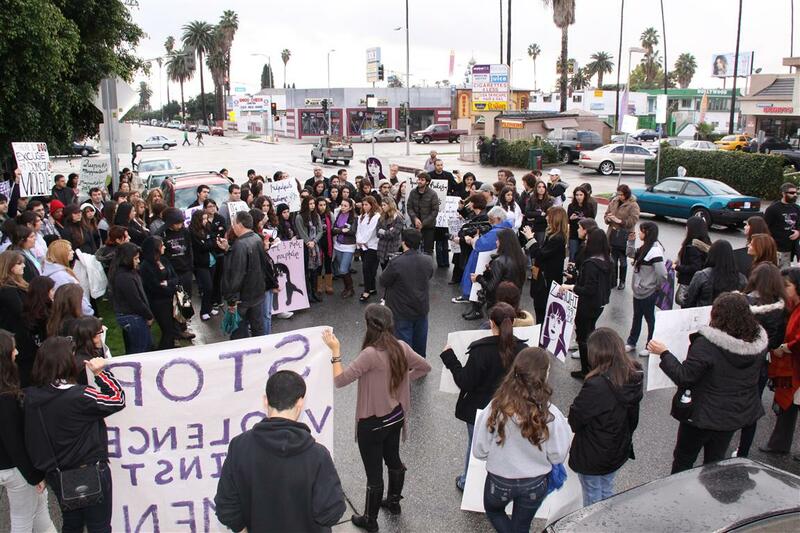 HOLLYWOOD, CA—Over two hundred men and women gathered in Little Armenia on Sunday, January 30, 2011, for a march to end violence against women, organized by the United Human Rights Council of the Armenian Youth Federation. Activists marched in memory of Zaruhi Petrosyan, a twenty year old mother who was brutally murdered by her husband and mother-in-law in October and to demand the just prosecution of all responsible parties. The march took place despite incessant morning rain, just hours before a solidarity protest was scheduled to take place in front of the Armenian Prosecutor-General’s office in Yerevan. Angered Armenians in the Diaspora and within Armenia demand that the government pass comprehensive domestic violence legislation and work to prevent and punish familial violence. Narine Jallatyan, a representative of the UHRC, spoke about the lessons Armenians can learn from women’s movements throughout history. She stressed that any problems plaguing Armenia are also problems of the Diaspora. Jallatyan urged the communities to take action to address domestic violence in the homeland and locally as well. Representing the Armenian Relief Society – Western Region, Nyree Derderian highlighted the importance of empowering women. She commended the AYF for their efforts in bringing attention to one of the most critical social issues facing Armenian women. Linda Qassabian of the YWCA of Glendale spoke about her emotional experiences counseling victims of domestic violence for the past 3 years. She stated that she continues to be saddened by the number of Armenian women that enter the shelter. During the march, activists paused to read aloud testimonials from victims of domestic violence in Armenia. These emotionally charged stories conveyed the message that the violent behavior against women can no longer be overlooked and no longer tolerated. “This is a small step that we have made together to ensure justice for one innocent victim, Zaruhi, who will remain in our hearts. This is also a small step to raise awareness and bring change in our communities here and in our homeland,” said marcher Gev Iskajyan. The United Human Rights Council (UHRC) is a committee of the Armenian Youth Federation. By means of action on a grassroots level, the UHRC works toward exposing and correcting human rights violations of governments worldwide, and aims to foster dialogue and collaboration between peoples who share this common vision. This really is a little something I have to find more information about, i appreciate you for the publish.